Heat oven to 350°F. Spray bottom only of 9x5-inch loaf pan with cooking spray. In medium bowl, stir together Bisquick™ mix, sugar, 1 1/2 cups of the cheese and the apple. In small bowl, beat sour cream, milk and eggs with whisk until blended. Add to apple mixture, stirring until blended. Pour into pan. Bake 1 hour; sprinkle with remaining 1/2 cup cheese. Bake 5 minutes longer or until cheese is melted and toothpick inserted in centre comes out clean. Cool 10 minutes. Run knife or metal spatula around sides of pan to loosen loaf; remove from pan to cooling rack. Cool completely, about 1 hour. 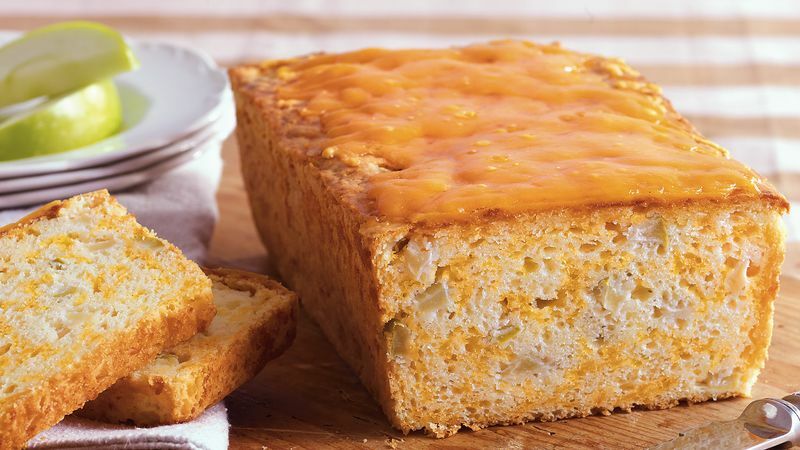 Serving Tip Slice and toast this cheesy bread for breakfast.